Combined with this establishment's apparent lack of ability to take the subject seriously, the corporate media seemed to do everything they could to follow suit in avoiding the consideration of non-terrestrial life altogether. This is what makes this abrupt change of script by Forbes and other established sources so suspicious. There are a number of whistleblowers who have consistently shown prior knowledge to many of these unusual disclosures about possible life on other planets. These people have telegraphed the numerous moves of corporate media and their reporting on these new and yet, out-of-place subject matters. These seemingly bizarre reports have been increasing in frequency since the year 2015. Back then, we the public began to see subtle hints at the same subjects we are seeing reported now. For the first time since the Roswell, NM crash was laughed off and forgotten, the corporate media has begun consistently hinting at the existence of developed life outside the Earth's atmosphere. Yet with all of these partial disclosures, the media has never followed through with their hints. It was interesting to see this animation appear on the Google homepage the week the discovery was first announced. However, I do not share the happy sentiment of the cartoon Earth in the image. Instead, I find it particularly annoying to see the gross negligence and irresponsibility shown by the media and scientific community in the lack of acknowledgement of their numerous previous errors. This reluctance of corporate media would not seem strange unless we the public had some verifiable data to suggest that life does in fact exist outside of our atmosphere and solar system. But what if we had compelling evidence? The previous half disclosures from the corporate media came alongside the extensive disclosures of the former Secret Space Program whistleblower, Corey Goode, who testified to his service in a space program which operated covertly and was completely independent from NASA or any other space agency. This Secret Space Program consists of a number of different groups, each with its own purpose and motivation for space exploration. Some of these groups look for resources to mine. Others look for signs of life, and then there are some that seek to control and conquer whoever and whatever they find in space. As it turns out, according to Goode and numerous other former SSP operatives, life and numerous signs of this life have been found both on near-Earth bodies and on numerous planets and moons throughout the solar system. This is said to be the true reason why NASA and the corporate media are subtly disclosing information about the reality of so many different Earth-like planets in our close stellar neighborhood. The real reason, according to numerous testimonies, is because life has not only been discovered, it has been found to be abundant. The reason that these issues are being hinted at in corporate media is that there has been a collective choice to disclose the reality of ET life in one way or another. Some groups do not want to reveal the entire truth because they are more interested in profit and self-advantage. These groups see more benefit in maintaining secrecy than in being completely forthright. There are other groups who are tired of maintaining such strict secrecy and intend to fully disclose the truth to humanity. This conflict has resulted in a sort of race to disclosure in some form. We will discuss the details in a moment, but first let's take a look at the article and see if we can read between the lines in this and other similar disclosures from the recent past. What is the significance of NASA's Feb 22, 2017 announcement? originally appeared on Quora: the place to gain and share knowledge, empowering people to learn from others and better understand the world. One of the most fundamental questions is “are we alone?” The answer to that question would shake the foundations of our understanding of the universe and our place within it. Much of our identity is framed on the presumption that we are a peculiarity. We see ourselves as the only intelligent species on the only planet that hosts life. We therefore make ourselves the center of the universe and elevate our position. The answer to “are we alone?” would shake the foundations of religion, philosophy, and biology. Finding other planets like our own would shake the foundations of astronomy and geology. Imagine you are a member of a primitive tribe, living on the plains thousands of years ago. You’ve led a sheltered life and your comprehension of the universe is defined only by your observations and the observations of your tribe. You strike out on your own across the plains, to see what else is there. Imagine seeing your first bird and having your worldview shaken by the realization that there are forms of life that can fly. You continue onward and reach the shore. Imagine seeing your first fish and having your worldview shaken by the realization that there are forms of life that can swim. We are almost that primitive in our understanding. We define life itself based upon our limited observation of it on our planet, Earth. All we really know about life is based upon observations of the life that formed on the planet Earth. From those observations, we conclude that life involves carbon and life requires water. So, we extrapolate that if we can find places where water and complex carbon based molecules exist, then life may also exist. That may well be short-sighted. There may be life that doesn’t need water nor carbon. But, chemistry tells us that life is more likely to be based on carbon than on any other element. Carbon is the lightest, most abundant, element with four valence electrons in a shell capable of eight. That means a carbon atom can form four covalent bonds while nitrogen (to its right) can form three and oxygen (to nitrogen's right) can form two. Carbon can also form double bonds, allowing strong (but not so strong the molecules can't change), complex, branching molecules. This means carbon is a light and abundant element capable of forming very complex and flexible molecules. Life is complex. Life needs to be flexible to survive. Water is also viewed as a near prerequisite for life. Water is a universal solvent. It can dissolve many substances, making it extremely valuable at transporting materials in and out of living cells. So, we look for complex carbon molecules and we look for water and we look for temperatures at which that water can be a fluid. So far we’ve found no life and few places that might sustain life. But today, NASA announced the discovery of a solar system that contains seven rocky worlds, all with the potential for water on their surface. Three of those seven planets are in the habitable zone (a region around the star with an environment much like the region where our planet Earth orbits). We have found multiple places, within a single star system, where life might exist. 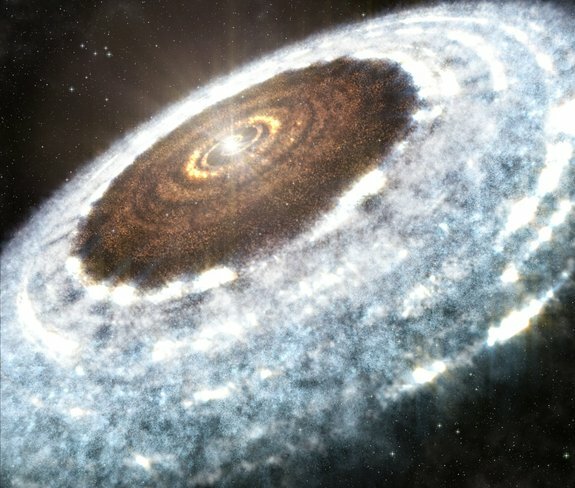 Not only does this give us a great specific target to direct further study, but it raises our confidence in the idea that Earth is not only not unique in its form, but that planets of similar form might actually be quite common. We have scanned an almost infinitesimally small amount of our galaxy, looking for planets similar to Earth, and yet we’ve found multiple planets that might be like Earth. 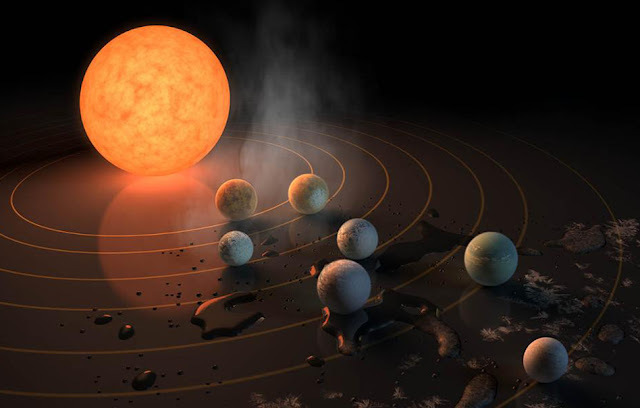 Maybe they are more like Mars or more like Venus, further study will tell, but with each additional discovery of small rocky planets, abundant in carbon, friendly to water, and moderately irradiated by their star, confidence in their commonality exists. Astronomer Frank Drake proposed an equation that has become known as the Drake equation: N = R* • fp • ne • fl • fi • fc • L.
The Drake equation proposes that if we multiply the rate of formation of stars suitable for the development of intelligent life by the fraction of those stars with planetary systems by the number of planets, per system, with an environment suitable for life by the fraction of suitable planets on which life actually appears by the fraction of life bearing planets on which intelligent life exists by the fraction of civilizations that develop a technology that releases detectable signs of their existence, into space, by the length of time such civilizations would continue to broadcast, we would arrive at the number of civilizations in the galaxy that could possibly be detected. Much of that equation is, today, guesswork. We have no concrete ways to determine the numerical values. We have to speculate and speculation is qualified by our observations. This discovery, announced today, gives us better confidence in putting a more optimistic number into that middle term ne. In our own solar system, we know of one planet that certainly is suitable for life and two planets that at one time may have been suitable for life. 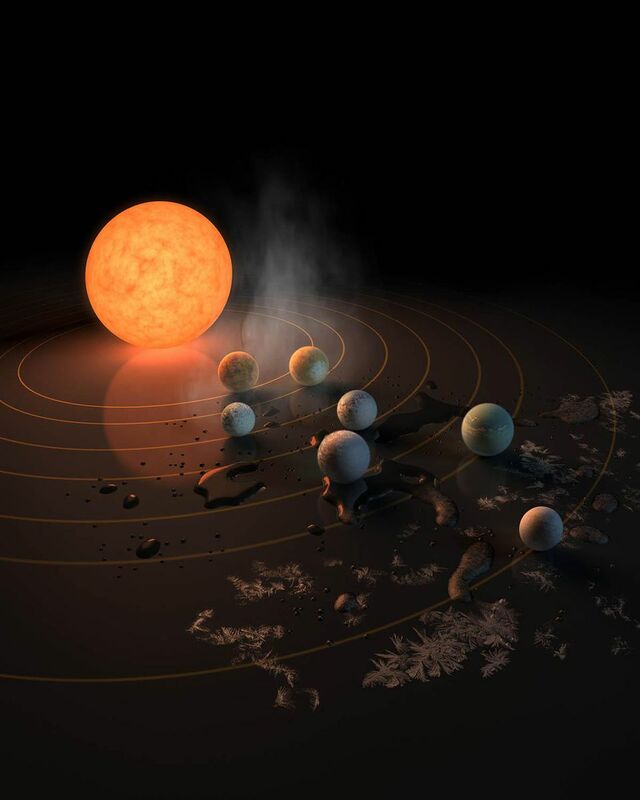 Today, a discovery of another solar system with between three and seven planets that may well be suitable for life. We need to continue to make similar discoveries to become more and more confident. Someday, soon, we may actually reach the point where we are comfortable saying that a star that could potentially support life is more likely than not to also have planets that could support life. Such an revelation would dramatically change the value of N in the Drake equation, giving us more and more confidence in the idea that we are not alone. We need to develop ways to better study this system (TRAPPIST-1). In one location in the sky, we have three to seven targets that could reveal information that would radically affect multiple branches of science and possibly the way we see ourselves in the universe. We have been taught by the scientific establishment that life was scarce in the universe and that there was a very slim chance that we would ever find it. However, that was nothing more than a blind assumption that became popular without ever being proven. Now, with the help of the Hubble and Kepler space telescopes, we find out that Dr. Frank Drake's equation was light-years off base. The proposal that life in the universe was scarce was based on nothing more than blind assumption. The Drake equation was celebrated as being reliable in determining the number of intelligent races in the universe. Yet this equation had no data to substantiate it. To add, the theory of evolution blindly assumed that life was an extremely rare in the universe and that the chances were extremely slim that life would form on Earth. Without any proof that this assumed scarcity of life was factual, the scientific community upheld this aspect of evolution as true and reliable. However, actual data has begun to deflate these formerly upheld norms within the establishment. In fact, scientists now estimate that the number of Earth-like planets could be upwards of 20 billion in our galaxy alone. The data also shows that water is not only abundant in our galaxy, but that stars themselves are water generating factories. Virtually every star holds potential for blasting out millions of metric tons of water on a constant basis (or at least at certain phases of development). Consequently, astronomers have now accepted the strong possibility that life may form wherever water exists, and now that we see how many exo-earths could actually exist, we may realize the equally strong possibility that life could and most likely has evolved on these planets. If this life began a few million years ago, this could mean that the beings we found there could be as developed or even far more developed than we ourselves are. This would mean that the UFO phenomenon is not as ridiculous as corporate media has attempted to portray it over the years. In reality, if our extra-planetary neighbors had significant time to develop, the these off-worlders just might develop interstellar travel, seeing that we have come so close to achieving it (at least on public record). In this case, they may decide to swing by and see how our own space travel capabilities are progressing. In fact, according to numerous operatives and former operatives from within the SSP, these visitations have been occurring for some time now. According to many of those who have reported to interact with these beings, Hollywood got it all wrong. The fictional aspect that has been consistently misrepresented in movies is that beings from other planets are somehow hideous and grotesque monsters. However, this has never been encountered by any of the firsthand witnesses that have come forward. According to these official witnesses, the major consistency among non-terrestrial life is that these beings look a lot like us. There are subtle differences such as height and proportions of features, but for the most part, there are much more similarities than differences. The idea of off-planet life may seem very far-fetch to some. However to others, the idea of interacting with people from other planets is nothing new. In fact, for many it is fairly normal, according to the multiple SSP operatives who have come forward. Many of the ET groups they have encountered have their own motivations for exploration much like we do. Some look for resources while others explore. There are a select few groups that seem to value conquest and exploitation, and according to reports they have posed a problem on numerous occasions. However, these negatively oriented beings are the stark minority in comparison to those that are primarily benevolent. According to the most consistent and reliable reports, there is a specific reason as to why the corporate media has so quickly switched its narrative from no ETs to numerous possibilities of ET life. This is that they are being pressured by those who run a few of the negatively oriented Earth groups to disclose a small portion of the truth. These are the same groups that have successfully orchestrated the ET secrecy we have been fed by corporate media up until present day. We were convinced by these people that it was laughable to consider life on other planets and that we should forget the thought altogether. Yet now this narrative has turned on a dime, and we are supposed to believe that the possibility is now real. The truth is that to keep this level of secrecy requires those keeping the secrets to commit numerous crimes in order to maintain the secrecy. According to hundreds of whistleblowers, these crimes have been taking place for decades of time and include countless instances of threats and assassinations, as well as a century of global economic exploitation. It is the hope of these career criminals in government offices and in the corporate world to use a series of half-truths to distract the public away from the increasing amount of embarrassing disclosures which will most definitely incriminate them. This is the primary reason why we find this race between groups attempting to promote their partial disclosures and those which aim to achieve full disclosure. Needless to say, full disclosure would be most beneficial to humanity, as this would allow the global crimes against the Earth's population to end for good. Once again, this scenario may sound very strange to those unfamiliar with the subject. However, those of us who have been responsible about collecting evidence and researching these topics consider them very likely to be true. If you would like to learn more on this topic, see the links below. Those marked Wisdom Teachings may be most helpful places to start.